Plain strings are made of a solid nylon clear filament. Nylon produces rich pure treble tones with percussive attack. Wound strings are made of 80/20 bronze wrapped around a multi-filiment nylon core. Ball end classical strings for faster installation. 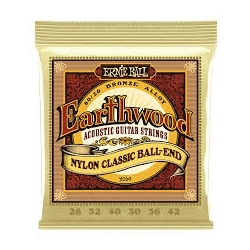 Ernie Ball Earthwood Bronze Wrapped Nylon Folk Guitar strings are made from 80% copper, 20% zinc wire around nylon core. Sweet classic tone. All Ernie Ball strings are precision manufactured to the highest standards and most exacting specs to assure consistency, optimum performance, and long life.